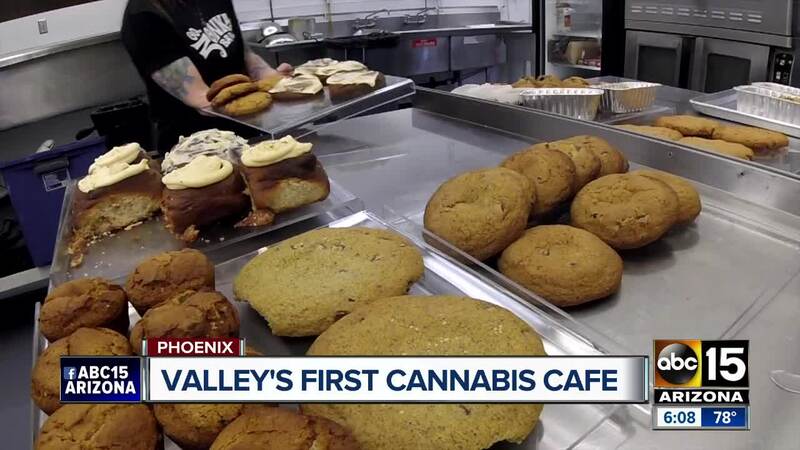 PHOENIX, AZ — The Valley's first hemp café is now open for business. Maricopa county officials have given Hempful Farms Café the green light to start serving food. It is located near 19th Avenue and Bell Road with the cafe's store. Owner Chris Martin called this a dream come true. "We put almost a $100,000 in fixing this place up. I guess I see the future, and I see what this is going to turn into," he said. The dishes served up at the café use everything from hemp flour to hemp oil and hemp seeds. Martin, who has always been a "foodie" and has experience working as a chef at several Valley restaurants, said it has always been his vision to bring hemp from the farm to the table. "[Hemp] is 50-percent higher in protein than whey and it's more easily digested. Also the Omega 3 and 9 levels here are off the charts," said Martin. He described all the food he cooks as clean and healthy. A big favorite among clients were his hemp-infused biscuits and gravy. The biscuits are made with sweet potato and hemp flour. The sausage gravy was made with hemp milk, hemp seeds, and turkey sausage. "I also garnish it with hemp seeds just to give it that nutty, oaky flavor," said Martin. Other popular items were the hemp-infused baked goods, such as cinnamon rolls, brownies, cookies, and muffins. Martin said he starts cooking at 5 a.m. While hemp falls under the Cannabis sativa family like Marijuana, Martin said the two were completely different plants. "I get asked everyday, the two days since we've been open, can I get high off anything on your menu? Or does it taste like marijuana? None of it does," he said. The hemp plant does not contain high amounts of THC, the psychoactive compound that gets people "high." He described the taste of hemp seeds as similar to that of unsalted sunflower seeds. Martin said he realized some people still had a stigma about the word "hemp," but he hopes to erase that with education and serving up good food. ABC15 Arizona reached out to the U.S Food and Drug Administration to find out what the current policy is on consuming hemp. FDA officials gave us a long statement which can be viewed in full, here. The part pertaining to the consumption of hemp states: "It should also be noted that some foods are derived from parts of the hemp plant that may not contain CBD or THC, meaning that their addition to foods might not raise the same issues as the addition of drug ingredients like CBD and THC. We are able to advance the lawful marketing of three such ingredients today. We are announcing that the agency has completed our evaluation of three Generally Recognized as Safe (GRAS) notices related to hulled hemp seeds, hemp seed protein and hemp seed oil and that the agency had no questions regarding the company’s conclusion that the use of such products as described in the notices is safe. Therefore, these products can be legally marketed in human foods for these uses without food additive approval, provided they comply with all other requirements and do not make disease treatment claims." The cafe is open everyday but Tuesdays. The hours are 8 a.m. - 2 p.m.